97 For the first time since 1980, Michigan posted its third consecutive shutout with a 38-0 win over Northwestern. It is the first time in 20 years a FBS school has had three shutouts since Kansas State did it in 1995. Over that span, the Wolverines have scored 97 unanswered points with wins over Maryland (31-0), BYU (28-0) and now Northwestern. The defense hasn't allowed a point in 41 straight defensive possessions and have outscored opponents 157-7 in the past 19 quarters. Oregon State was the last team to score on the Wolverines. Michigan is just the fifth team to have multiple 28 points or more shutouts over teams ranked in the AP Poll. The Wolverines’ 1948 team also accomplished this feat. 6 The Utah defense put tons of pressure on California quarterback Jared Goff and it worked in its favor against the Golden Bears. The Utes forced six total turnovers including three on the first four drives of the game. Their five interceptions are the most in a single game for the program since facing BYU in 2008. It was also the first time California has thrown five interceptions since 1998 when Arizona State picked off the Golden Bears five times. 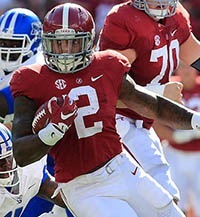 11 Derrick Henry broke the Alabama record for most consecutive games with at least one touchdown in the 24-17 win over Arkansas. His 1-yard touchdown in the fourth quarter extended his streak to 11 games. The previous record belonged to former Crimson Tide quarterback Terry Davis, who played in Tuscaloosa from 1970-72 and scored in 10 straight games. The last time Henry failed to reach the endzone was against LSU last season on Nov. 8. 21 Facing a 21-point deficit didn’t seem to be a problem for Tennessee against rival Georgia. Quarterback Joshua Dobbs led the charge with his five total touchdowns in the 38-31 comeback victory. The win tied the Vols’ third-biggest comebacks in program history. Tennessee had to previously overcome 21-point holes against Kentucky in 2001 and LSU in 2005. It was four points shy of the overall school record. The win was also the Vols’ first win over a top-25 team since they defeated then-No. 11 South Carolina in 2013. 59 Portland State isn't a stranger to upsets over FBS opponents this season. Weeks after their upset over Washington State, the Vikings were at it again, this time with a dominating 66-7 rout over Conference USA opponent North Texas. The 59-point win was the largest by an FCS school over an FBS school ever in NCAA history. 313 Texas’ shocking upset over Oklahoma in the Red River Rivalry can basically be attributed to the Longhorns’ impressive rushing numbers. D’onta Foreman rushed for 117 yards and quarterback Jerrod Heard added 115 on the ground, marking the first time in 20 games that Texas had a pair of 100-yard rushers. Overall, Texas produced 313 rushing yards, the first 300-yard rushing game since 2013 against New Mexico.